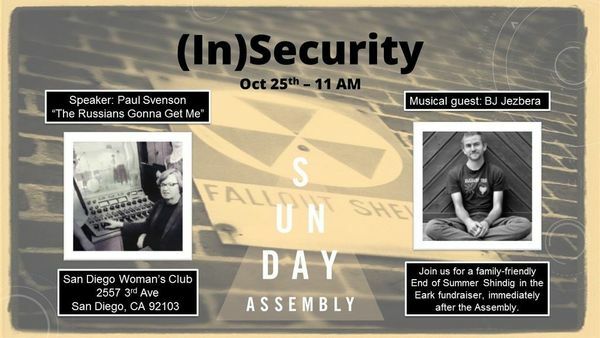 Our very own Paul Svenson, songleader extraordinaire, will tell us about growing up during the Cold War, in a very “us vs. them” era, steeped in a culture of fear. Yet, here we still are today. Paul will talk about the Cold War and its parallels in modern culture and how we can each help provide safe places for our children, families, and friends. And, because it’s Paul, it’ll have a musical kicker. Guest songleader BJ Jezbera will pinch hit for the usual cheesy/fun/embarrassing/schmaltzy singalongs. Immediately after the October Assembly, we’ll be having an End of Summer Shindig in the Park fundraiser with food and excellent company. Please join us!